Mahindra's new XUV300 entry into the compact SUV segment will not only cause an upheaval to the likes sub 4 meter SUVs like Maruti Brezza and Tata Nexon, but will also have the likes of Hyundai Creta in its crosshair. Mahindra’s new XUV300 compact SUV is set for launch later this week. It has been regaled as an outstanding SUV with several first in class and best in segment features. This will help XUV300 not only to compete with cars in its segment, like the Maruti Brezza and Tata Nexon, but also with cars above its segment, like the Hyundai Creta and Renault Duster. In an earlier post, we had compared Mahindra XUV300 with the likes of Tata Nexon, Maruti Brezza and Ford EcoSport. In this post, we will take a look at the specs sheet of XUV300 and 2019 Hyundai Creta in terms of exterior design, interior updates, safety, engine and price. 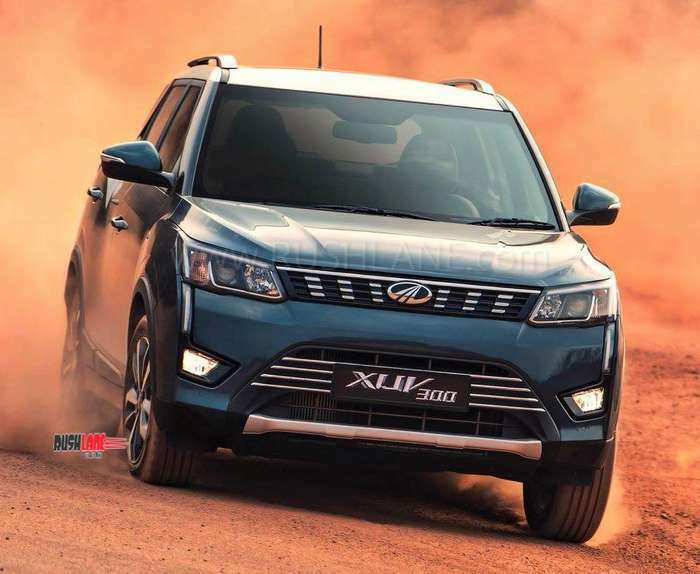 Exteriors – Mahindra XUV300, the cheetah inspired compact SUV is positioned on the same X100 platform, which also underpins the SsangYong Tivoli. It is offered in four variants of W4, W6, W8 and W8(O). Sharing a number of design cues from its much larger sibling, the XUV500, the XUV300 is seen with well appointed exteriors. It gets boomerang shaped LED DRLs both at the front and rear, fog lamps, a large sunroof, roof rails, pronounced wheel arches and 17” diamond cut alloy wheels. 2019 Hyundai Creta is presented in six variants – E, E+, S, SX, SX dual tone and SX(O) variants along with a new variant called the SX(O) Executive. It boasts of LED tail lamps, a large grille, redesigned bumper, horizontal fog lamps as against vertically positioned fog lamps on its earlier counterpart and a new skid plate on its bumper. Wheels have also been redesigned while rear bumper gets updated with repositioned reflectors and a fin antenna. Dimensions – Mahindra XUV300 stands 3,995mm in length, 1,821mm in width, 1,617mm in height and gets a 2,600mm long wheelbase. 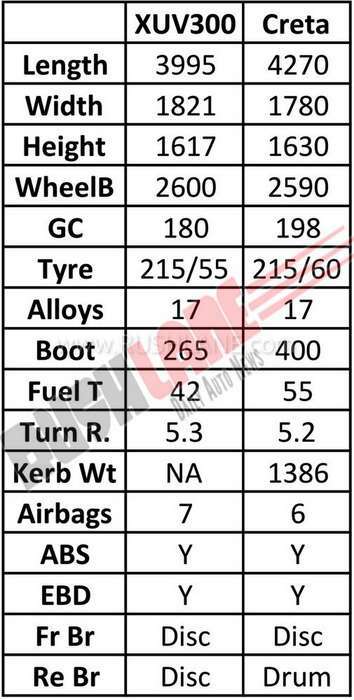 Ground clearance is at 180mm while boot space is at 265 liters and fuel tank is of 42 liter capacity. Hyundai Creta on the other hand stands 4,270mm in length, 1,780mm in width and 1,665mm in height. It has a wheelbase measuring 2,590mm and boot space of 405 liters while fuel tank is larger with 55 liter capacity. Interiors – Mahindra XUV300 gets dual tone interiors in black and off white color scheme. Its dashboard sports silver accents as is also seen on its central console while door arm rests get contrasting piano black accents. The XUV300 gets a large 7”touchscreen infotainment system with smartphone connectivity options of Apple CarPlay and Android Auto. It also gets sunroof. 2019 Hyundai Creta also gets a dual tone interior. Sporting a five seat layout, the Creta gets fully automatic climate controls, 6 way electronically adjustable driver seat, a sunroof and ventilated front seats. It also gets a leather wrapped steering wheel with audio and Bluetooth controls and a touchscreen infotainment system with 4 speakers and 2 tweeters. More or less, interior features are same, only difference is space. Creta offers more space. Safety Features – Both the XUV300 and Hyundai Creta comply with new safety regulations. The XUV300 gets ABS and EBD as standard, hill descent, traction control, power windows, rain sensing wipers, auto headlamps, parking sensors with camera at the front and rear and an auto dimming inner rear view mirror. An outstanding safety feature on the XUV300 is the inclusion of 7 airbags, the most amount in its segment. 2019 Hyundai Creta gets 6 airbags, ABS, EBD, rear parking sensors, speed alert and seat belt reminder as standard across all variants. 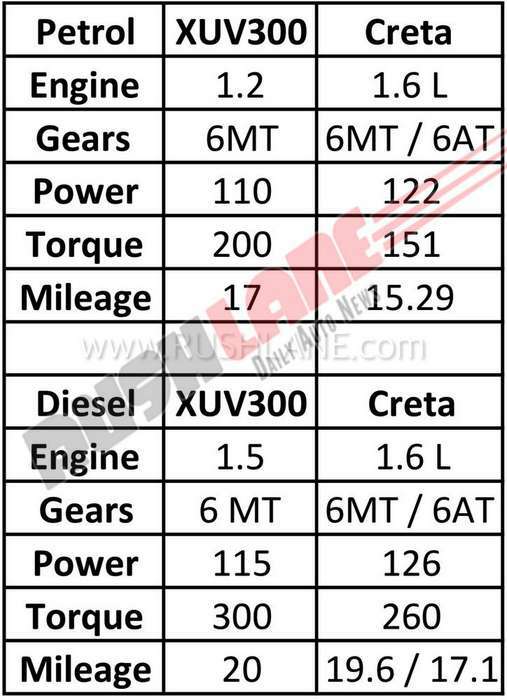 Engine Specifications – Mahindra XUV300 with both petrol and diesel engine options sees its 1.2 liter turbocharged petrol engine offering 110 PS power at 5,000 rpm and 200 Nm torque at 2,000-3,500 rpm. The diesel engine offers 115 PS power at 3,750 rpm and 300 Nm torque at 1,500-2,500 rpm. The engines get mated to a 6 speed manual transmission. Mileage is 17 kmpl for petrol and 20 kmpl for diesel. Automatic option is not on offer. 2019 Hyundai Creta gets its power via 1.4 liter CRDi diesel engine offering 88 hp power and 219 Nm torque where its base variants are concerned while top end variants get a 1.6 liter dual VTVT petrol engine offering 121 hp power and 151 Nm torque. It also gets a 1.6 liter CRDi VGT diesel engine belting out 126 hp power and 260 Nm torque. Both petrol and diesel options are offered with manual as well as automatic transmission option. Price – Mahindra XUV300 variant pricing has not been revealed. But, Mahindra did confirm that ex-sh pricing will be in the Rs 8-12 lakh range. The 2019 Hyundai Creta is priced way above prices of the XUV300, starting from Rs.9.60 lakhs for its base variant going up to Rs.15.63 lakhs for its top spec model. 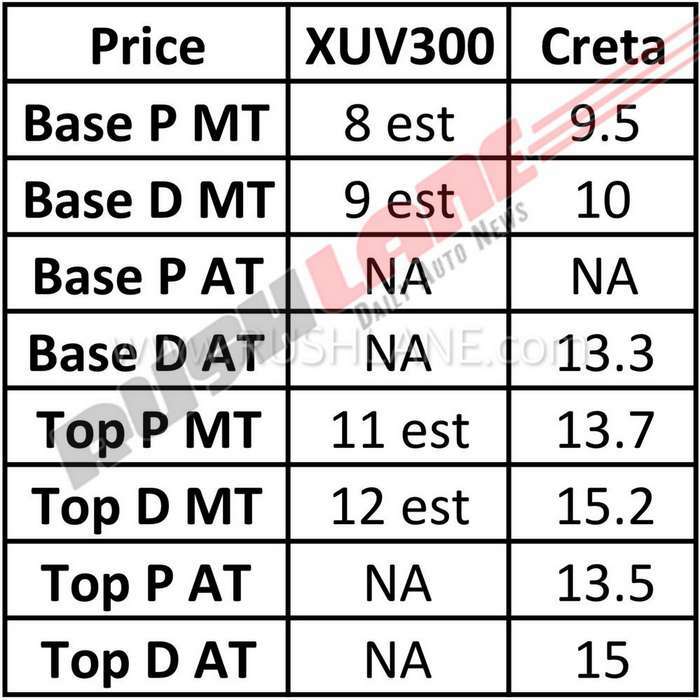 For those who are buyers of top variants of Creta, XUV300 does not make sense. But those who are planning on buying entry or mid variants of Creta, XUV300 might look tempting. Yes it has a few shortfalls, for example, boot space is lesser, but it also has its gains – smaller car, easy to maintain, easy to park, etc. It will be interesting to see if launch of XUV300 does have any negative effect on sales of Hyundai Creta, or not.